This picture was taken on the occassion of the Hadigaun festival during Lava Jatra of Tundal Devi ( located in Kathmandu, Nepal). 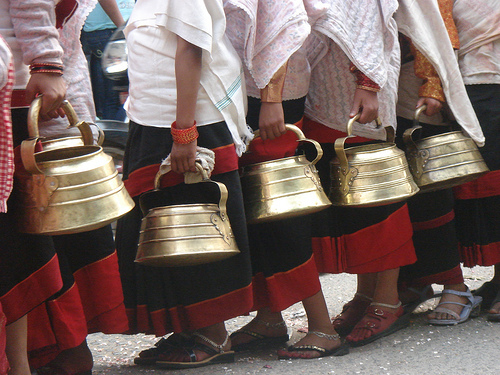 During this festival people celebrate and worship Goddesses Bhatbhateni and Tunala Devi. In this festival females (young girls as well as married women) of the town fast for the whole day to please the Goddesses and carry out a procession from Bhatbhatni to TunalDevi (Hadigaon). It is belived that doing this will ensure their family prosperity and unmarried girls will get a good husband.